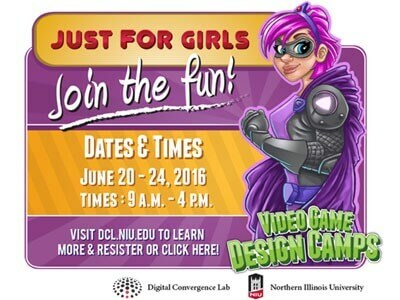 Girls interested in creating and playing their own video games can now register for the NIU Digital Convergence Lab’s “Just for Girls!” video game design camp. This day camp for students entering fifth- through ninth-grade will take place on the NIU campus from 9 a.m. to 4 p.m. Monday, June 20, through Friday, June 24. Campers will explore and analyze popular contemporary games to see what makes them tick, then learn how to design and program their own games from scratch. Sessions will focus on everything from programming virtual spaces and game interfaces to developing compelling characters and storylines. All instructors and guest speakers will be women, demonstrating to campers that girls can and do succeed in gaming and other technology-related fields. The camp has space for only 20 participants, so early registration (available online) is recommended. For more information, email aclick@niu.edu.